that can be modeled without needing to manipulate the data itself. "If source data can reside anywhere, but its location can be indexed, and its intelligence extracted and shared, then this reduces dependence on proprietary software, private storage solutions and massive transfer bandwidth needs," said Davis, who leads product innovation at OneOcean. ClipCard At the heart of OneOcean's technology is an approach for locating, mod- "The dependency on software is deepening as data gets bigger. The volume of marine data is indeed growing at a staggering pace." eling, abstracting and sharing big-data sets leveraging a cloud-computing infrastructure. ClipCards are abstracts that feature a data set in a lightweight AT SEA, RELIABILITY IS EVERYTHING. Evanscaps are hermetically-sealed tantalum capacitors known for reliable energy in adverse conditions. They deliver sea level and deepwater power for communications, controls, power fltration, data storage, pulse power, navigation and more. Compact and corrosion-resistant, energy-dense Evanscaps are specifed from outer space to the depths of the ocean. 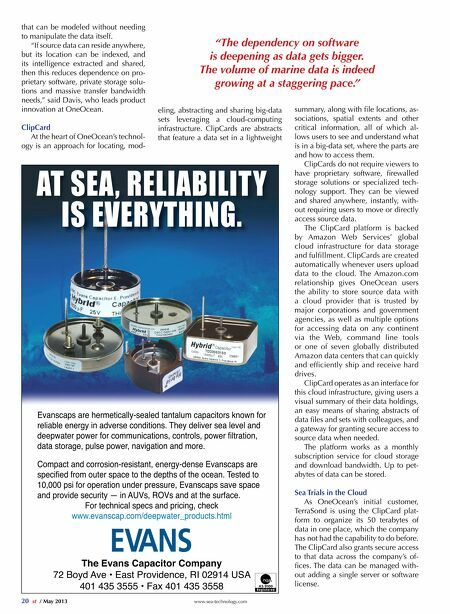 Tested to 10,000 psi for operation under pressure, Evanscaps save space and provide security — in AUVs, ROVs and at the surface. For technical specs and pricing, check www.evanscap.com/deepwater_products.html The Evans Capacitor Company 72 Boyd Ave • East Providence, RI 02914 USA 401 435 3555 • Fax 401 435 3558 20 st / May 2013 www.sea-technology.com summary, along with fle locations, associations, spatial extents and other critical information, all of which allows users to see and understand what is in a big-data set, where the parts are and how to access them. ClipCards do not require viewers to have proprietary software, frewalled storage solutions or specialized technology support. They can be viewed and shared anywhere, instantly, without requiring users to move or directly access source data. The ClipCard platform is backed by Amazon Web Services' global cloud infrastructure for data storage and fulfllment. ClipCards are created automatically whenever users upload data to the cloud. The Amazon.com relationship gives OneOcean users the ability to store source data with a cloud provider that is trusted by major corporations and government agencies, as well as multiple options for accessing data on any continent via the Web, command line tools or one of seven globally distributed Amazon data centers that can quickly and effciently ship and receive hard drives. ClipCard operates as an interface for this cloud infrastructure, giving users a visual summary of their data holdings, an easy means of sharing abstracts of data fles and sets with colleagues, and a gateway for granting secure access to source data when needed. The platform works as a monthly subscription service for cloud storage and download bandwidth. Up to petabytes of data can be stored. Sea Trials in the Cloud As OneOcean's initial customer, TerraSond is using the ClipCard platform to organize its 50 terabytes of data in one place, which the company has not had the capability to do before. The ClipCard also grants secure access to that data across the company's offces. The data can be managed without adding a single server or software license.